Today I am going to demonstrate how to do a safe squat. I am passionate about exercise and especially about how exercise can benefit people with osteoporosis, osteopenia, or low bone density. 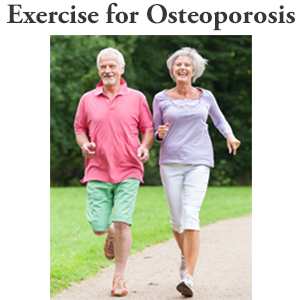 However, people with osteoporosis need to pay special attention to the exercises that they practice. Exercise is very beneficial but the wrong exercise, or the right exercise done incorrectly, can cause considerable harm to you and your bones. Recently, I have had several new clients show me exercises prescribed to them by personal trainers. The exercises that they were doing increased their risk of fracture. Unfortunately, although this personal trainer had the best of intentions, he is not familiar with the issues faced by a person with low bone density or osteoporosis. This is why I developed the online Building Better Bones course for health and fitness professionals. In the video I show a safe squat technique and incorrect form of the squat exercise. The squat is a great weight-bearing exercise. 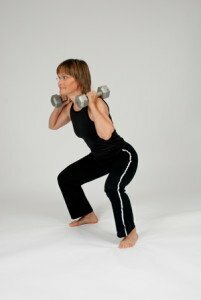 The safe squat exercise that I show is the Squats with Weights exercise that is part of the Athletic Level Exercise for Better Bones Program. Rest the weights on your shoulders and close to your body. The form taught to my new client by her personal trainer had her arms extended out with the weights in her hands. A 1984 study examined the effects of loading the spine close to the body and away from the body. The study found that placing the weights away from the body dramatically increased the compressive forces on the spine. A weight of only 2 kilogram in each hand was high enough to lead to compression fractures of the lumbar spine. My recommendation is that you should follow an exercise program. The benefits are many. However, if you have low bone density or osteoporosis, be cautious about the trainer you work with. 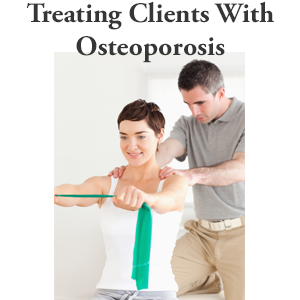 Try to find a professional who has some training in osteoporosis exercise and can design a program that safely meets your needs. 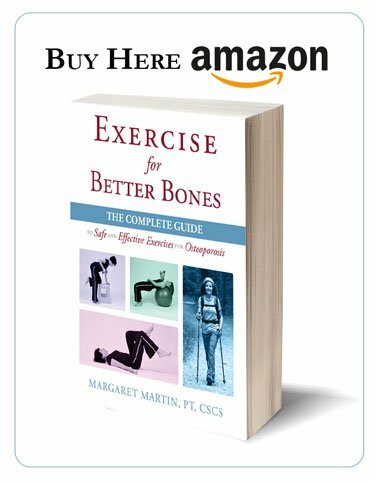 I’m Margaret Martin, and those of you who have been following me know that I am very passionate about exercise and especially the effect that it can have on bone. Today I want to share with you an unsafe squat as well as reviewing safe squatting. This has been brought to my attention from several clients who have come from personal trainers. These clients are well-meaning. They have been wanting to do things that are healthy for their bones. These trainers maybe are also well-meaning but not well-educated in safe techniques for people with low bone density or osteoporosis.So here goes. In the Exercise for Better Bones program you will see at the athletic level squatting done with weights held at the shoulders. In this way the weight is very close to the body. There was a study back in 1984 where they looked at the loading of the lumbar spine, specifically L3, when this amount of weight, roughly two kilograms or five pounds was held in at the body versus being held out in front. So the technique that I’m very upset when I see people telling me that this is the squat that they’ve been taught to do. Please do a big X on that type of squatting, because that amount of force, the same amount of weight, instead of putting 1,800 newtons of force on the third lumbar vertebrae, it can bring up the forces into the spine well above fracture levels for somebody with osteoporosis. The forces go up in the area of 2,600 newtons of force. Continue doing things that are well for you. Continue following safe guidelines. What is your position on deadlifts? Either with a straight bar, hex bar or kettlebell. Are deadlifts also unsafe for osteoporosis? Deadlifts are hip-centric as opposed to quad & knee-centric like the squat. But the spine is actually even more vertical in a deadlift than a squat. I teach “air squats” a.k.a. squats without additional weight with the arms at the chest or on the hips so that – see chair squats in my book – so that individuals get used to having their arms in and not out in front of them which is more loading on the disc of the spine. 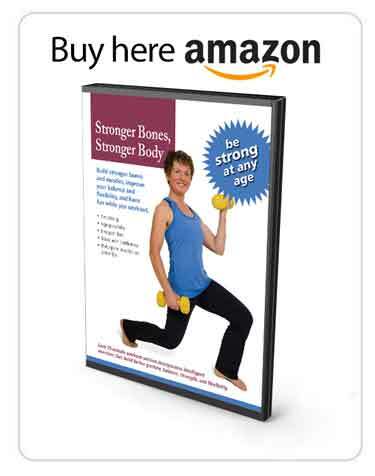 Hi Juliet, As a rule I do not teach deadlifts to my clients with low bone density or osteoporosis. I believe there are safer exercises that target the same muscle groups without putting the spine at risk. As for the number of repetitions 3 sets of 8 reps would be more bone building than a one set of 25 reps. Stay strong, safely! Sorry for the delay in responding – the Holidays got in the way. Please see my response to deadlifts above. All the best! When doing squats, is it safe for weights to be on your shoulders if you have had a fractured spine? Or better to holding them to your side of your body? Thank you!